After using BACCH filter with SIR plugin and my BruteFIR solution for about 6 months, I have never been a happier person. The reality that one can get from even a standard CD is just so “unreal” !!! However, since the key of achieving excellent XTC depends on accurate timing in assessing the ILD and ITD at the listening position. The BACCH filter is also pinpoint accurate for a given position. The downside is that you have a smaller than usual sweetspot. Outside this sweet spot, things are not as great (but the ambience is still there, definitely better than without BACCH.) The size of this sweet spot depends on how close you can physically place the speakers together. In the standard stereo dipole configuration, the sweet spot is reasonably large and you will be very comfortable with it. But since I need to accommodate a 55 inch TV between my speakers, my sweet spot is very very small. It was like 2 inches in width only. Great efforts has been made to keep my head within this sweet spot so I can enjoy the music ecstasy! While my ears are happy, my neck hurts……. Knowing this limitations, Prof continues to improve his products and come up with BACCH-SP. One of the greatest advancement in SP is the introduction of headtracking. This is really the first of this kind in the music reproduction history!! Well, I guess you DO need to be a rocket scientist to think of that!! 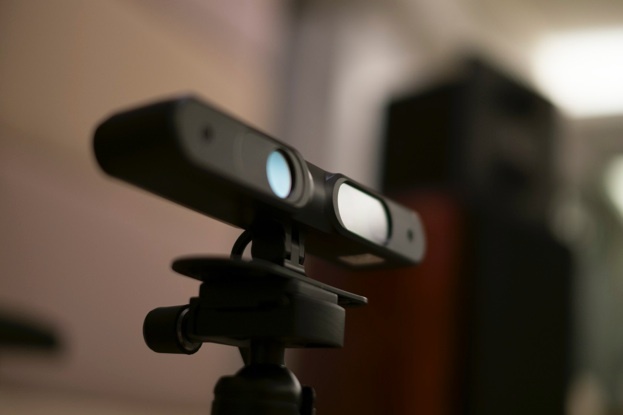 The headtracking function rely on the use of a small device like the one you use in Xbox. Function in the same way as XBox, it tracks your head in the X, Y, Z position. During the setup process, SP will ask you to move your head in the extreme left and right position so as to generate >40 BACCH filters over these extremes position. During play back, you head position is tracked and the appropriate filter will be used to achieve a perfect XTC at all positions. My sweet spot is now 2 feet wide! now my hear and neck are happy together. One of the issue in my setup is that I use linear XO which causes some delay due to the nature of the crossover. The delay is calculated by half of the filter taps / sampling frequency. If one uses very long delay, they may be issues in slowing the headtracking down. There are 2 tricks I used to solve this problem. One is to use a shorter filter taps (sacrificing filter resolution) and the second is to place the speakers as close as possible to increase the sweetspot size. I was told that the later version will even have this issues improved. In any case, if you use a minimal phase XO like a standard passive XO in most speakers, you will not have any issues. The transition among various filters are transparent, seamless and flawless! I suppose moving on, such head tracking function can also control the lateral response of the speakers by employing different filters to compensate for the loss of power when listening off axis. Such technology can also control lobbing behavior of the speaker drivers as well! The possibilities is only limited by imagination!! The second advantage of using SP is the unlimited generation of BACCH filters. SP now comes with its own microphone and calculation hardware. 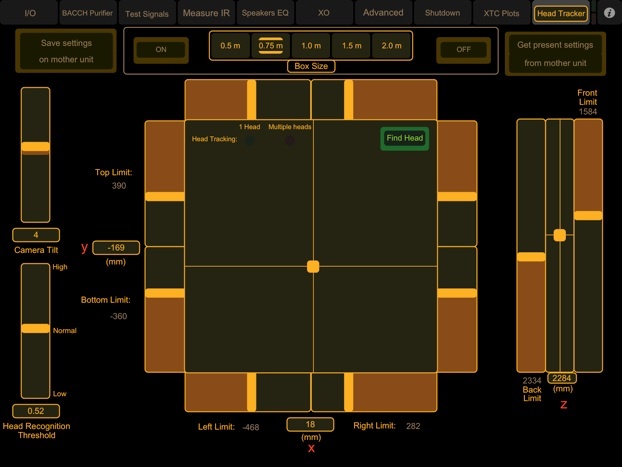 During the calibration process you place the headmic in just the same way as the beespoke service, you will then press a few buttons on a dedicated iPad and you will hear Prof’s voice to do this and that. After that, the calculation starts and in about 2 mins, you have a new filter. There are 7 banks where you can store the filter, each can be set up with headtracking function enabled. This way, you can do filters for everyone in your family or different speakers etc. Again, there is no limits! But SP is much more than this. It comes with USB in so you can use any computer Mac/Win/Linux to connect to your favorite player for play back. This also means you can use SP for your games and programs like Spotify. It is also equipped with digital in (SPDIF/AES/toslink) so you can use your CD transport as well. For those Vinyl lover, you can also connect your turntable to one of the analog in. As for play back, it also comes with its own DAC with 3 channels output. You can use SP as your digital XO for your active speaker system. The program also comes with EQ function for those who wants to dial in the frequency response that is pleasing to their ears. The complete clocking features are also available so you can slave SP to your favorite external clock as well! In other words, it is not a just an XTC processor, it is the soul of every music reproduction system! Switching from my original setup to SP is no pain at all. I just connect it after my mac mini and before the convolver PC. All functions on SP is accessed by a dedicated iPad and the control is very intuitive. So now everything is ready. How’s the sound. The sound is the same as before. After all, it is the same speaker and the same room. But with one advantage, I no longer need to mark the reflection on my TV to tell me I am in the right position. I can now move my head freely and still gets excellent XTC and stable image. There is no more collapse of 3D image, no more of drifting violin section to the center stage. All becomes rock solid stable. Do I care about the sound? Well I guess I care more about the music now as I can enjoy it with more freedom!